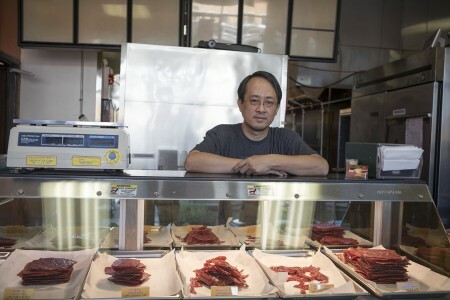 At Fragrant Jerky in Rosemead, CA, The Yap family is introducing the umami-rich pork jerky of Singapore and Malaysia, known as Bak Kwa, appealing to Americans insatiable appetite for jerky. It’s the perfect sweet-salty treat for on-the-go snacks or bar bites. 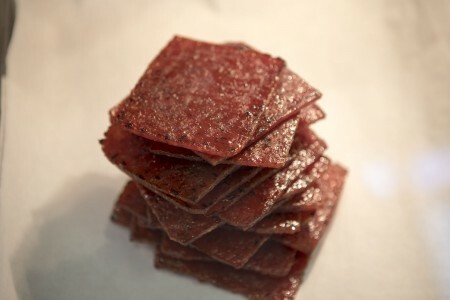 Bak Kwa is ground pork marinated with rice wine, soy sauce, sesame, sugar, five spice and a touch of fish sauce, then spread out to semi-dry for a couple of hours before smoking and grilling the edges until a light char forms bringing it to life. 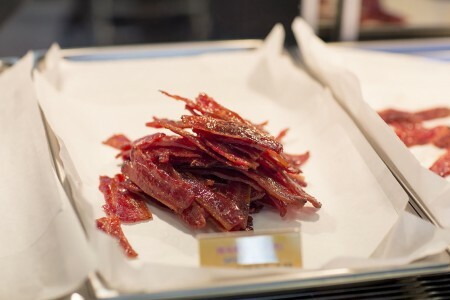 Beyond the traditional Bak Kwa, Fragrant Jerky also serves Tender Pork Jerky (minced pork) and Bacon Jerky (with degrees of spiciness). In Singapore, Bak Kwa is consumed in many ways – it can be made into a sandwich, used as an ingredient, served as part of a cold dish in an official banquet, munched on its own, served as a finger food, or enjoyed with beer. Malaysia, Danhi’s second home for nearly three decades, is a growing culinary star in America. To get a taste, the crawl visited Little Malaysia in LA’s El Monte neighborhood. Tucked in the back of a large strip mall, it’s one of less than ten Malaysian restaurants in Southern California. Chef Rachel is originally from Penang, a small island off the northwest coast of the Malay Peninsula, known for its hot, spicy dishes. The menu highlight was a dish called Penang Lobak – a new style of spring roll made with spice-marinated, cured pork wrapped in crispy tofu skin. The tasting also included a classic Pork Satay marinated in lemongrass, garlic, galangal, sugar, salt, turmeric and peanuts, and a special Bah Kut Teh Pot – Pork Bone Tea. A rich pork and garlic broth infused with angelica root, goji berries, star anise herbs and other spices for a balanced Yin Yang flavor profile. The tea is so complex most Malaysians buy a spice packet of this mixture to flavor the broth. Burma is a quiet member of the Southeast Asian cuisine community, but to food lovers delight is beginning to make a louder appearance on the culinary scene. 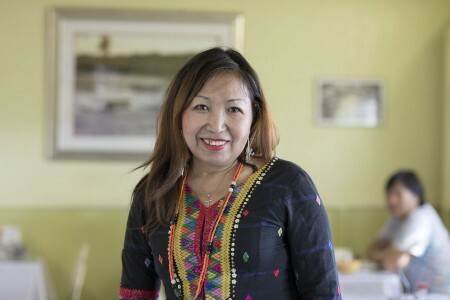 Yoma Myanmar is a gem in the San Gabriel Valley, run by Chef Gyung Lam, affectionately called Joan. 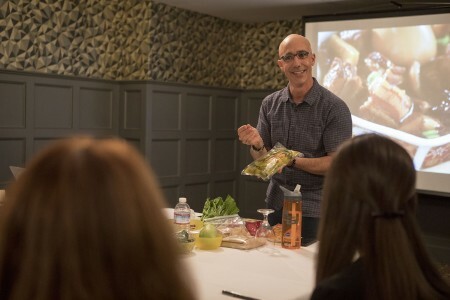 For 10 years, Chef Lam has worked to show Southern Californians what real Burmese food is and how their pantry creates a complex library of flavors. The crawl tasted Burmese Pork Curry with a dried spice base, and a Whetnaywet Thoke (shaved pig ear salad) with a traditional oil, lemon juice and chili flake dressing, with coarse chickpea flour to bind. 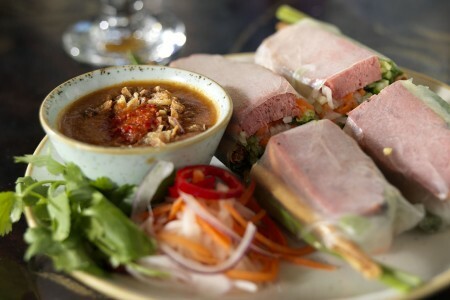 Complementing the pork dishes were two acidic and crunchy salads unique to Burma – Lahpet Thoke (tea leaf salad) and Myin Kwar Ywet (pennyworth salad). After Yoma, the crawl stopped at Kapistahan Grill in Filipino Town, west of downtown Los Angeles. 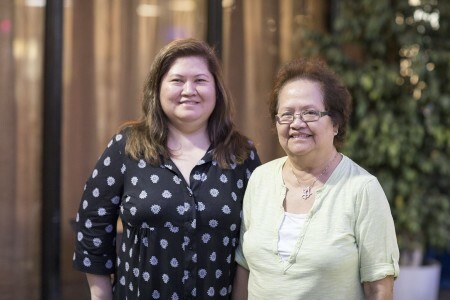 The restaurant offers traditional Filipino food and entertaining karaoke – the owners are singers, and the restaurant is a popular weekend hotspot. The Pork Adobo Duo tasting was serenaded by one of the owners, Ciamara Morales. The classic stew of pork leg with soy sauce, bay leaves, black pepper and garlic was balanced with a heavy dose of coconut vinegar, paired with delicious adobo fried rice. 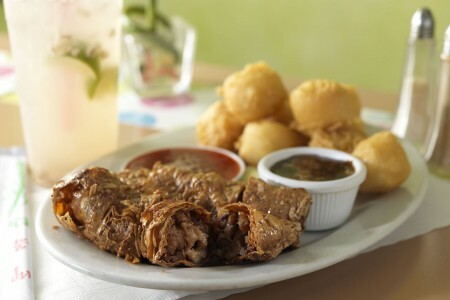 Next, was Crispy Pata – a partial leg of pig, simmered until tender in an aromatic broth, then chilled and deep-fried until crunchy on the outside and juicy on the inside. 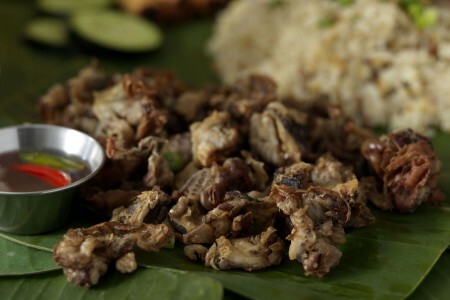 A first for even Danhi was Chicharron Bulaklak – translated as “flower pork cracklings” – made with ruffled intestinal membrane for feathery light crispy pork goodness. 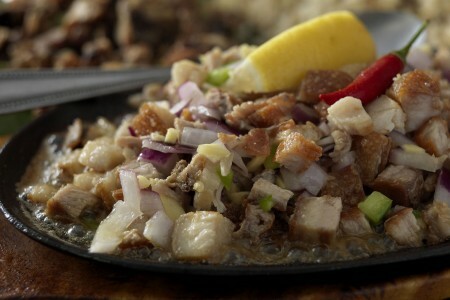 Lastly, a platter of Sizzling Sisig was served, crispy and tender chopped pork belly with pickled onions that was savory-sour-salty and mouth-watering good! The genuine flavors of Thailand are getting a lot of attention nationwide, especially the non-apologetic approach that’s heavy-handed with fish sauce, fermented shrimp, blood, liver and even water bugs. 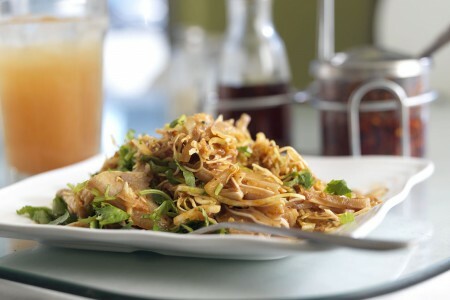 The crawl stopped at Pa Ord Noodles on Sunset Blvd run by Chef Lawan Bhanduram, also known as Ord. She is known for her amazing Tom Yum Noodle with five types of pork in one bowl (roasted, ground, balls, liver and broth), but the crawl stopped for the Moo Krob Pahk Kah Nah (crispy pork belly and Chinese broccoli). 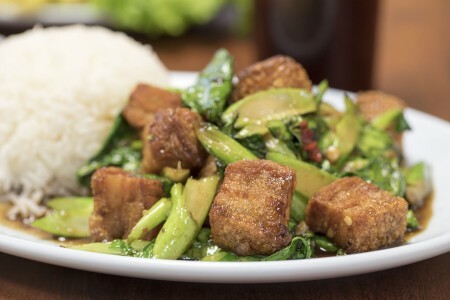 Thick wafers of pork belly were tossed with an oyster sauce-enriched stir-fry with emerald greens. Also on the tasting plate was Sai Krok Issan (fermented Thai sausage) – an unfamiliar taste for many due to its time-consuming preparation. 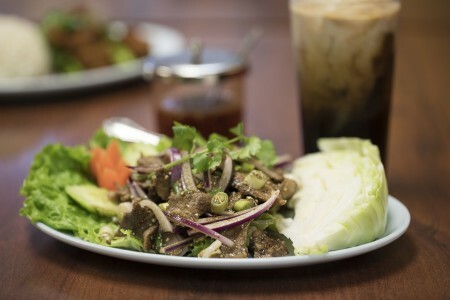 At Pa Ord, the sausage is grilled and served with raw green cabbage, slices of ginger, fresh Thai chilies and peanuts, for explosions of flavor at every bite. 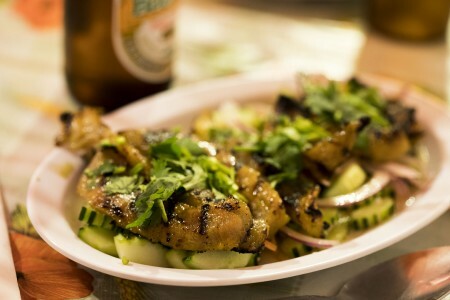 The last dish was the Yum Moo Yang (grilled pork salad), with slivers of grilled pork, raw slices of red onion and piles of cilantro tossed with a lime-fish sauce dressing held together with roasted rice powder. 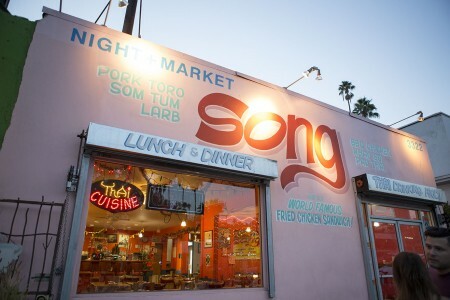 After tasting more traditional Thai food, the crawl stopped at Night+Market Song – a contemporary Thai restaurant with a 2016 Food & Wine Best New Chef accolade. Chef Kris Yenbamroong combines his hipster approach to interior design with the authentic flavors of Northwest Thailand. The area is so far north that very little coconut is used in their food, even in the Thai curries that most associate with this tropical favorite. 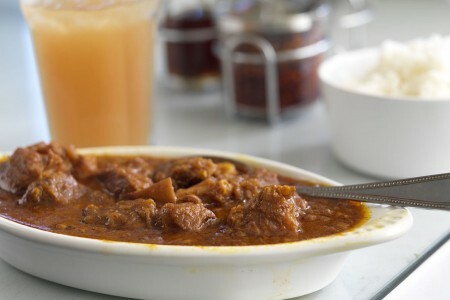 One of the favorite bites of the day was the Haeng Hanglay (pork curry). 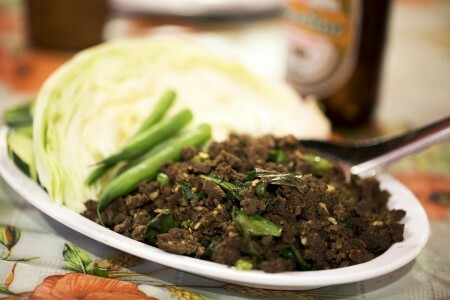 As much Burmese as Thai, its seasoned with soy sauce instead of fish sauce and the deep orange color comes from chilies. Also from the Northern area was Laarb Lanna, made with various innards, blood and liver to make it dark and rich, served with fresh cabbage to snack between bites to balance the experience. 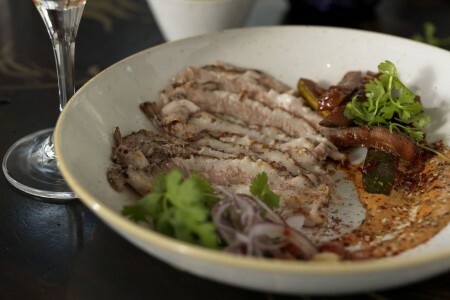 Last, and most surprising to most, was the Moo Yang Nom Khon – grilled fatty pork shoulder – marinated in condensed milk and turmeric and served with a sweet-and-sour cucumber relish. 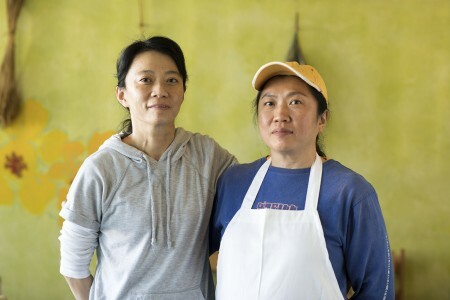 The last stop on the pork crawl was Little Sister in downtown LA, lead by Chef Tin Vuong and restaurateur Jed Sandford. 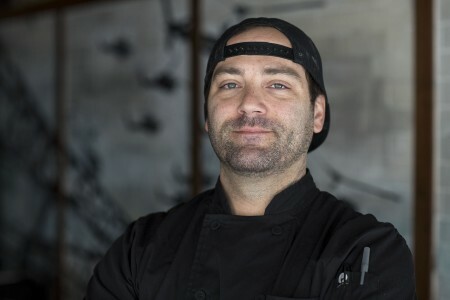 Here, Chef de Cuisine Michael Segerstrom translates the flavors of Southeast Asia, primarily Vietnamese, into an upscale restaurant experience with artistic graffiti decorating the walls in the dimly lit dining room. The Smoked Pork Jowl with pickled veggies melts in your mouth. 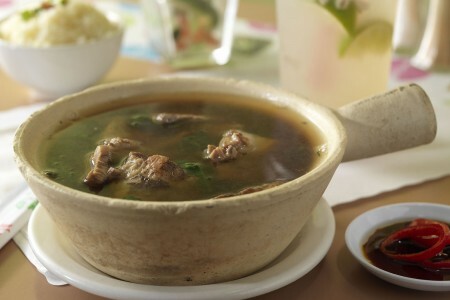 Every Asian country has a soy-simmered pork dish with eggs – in Vietnam they use coconut water as part of the simmering liquid. At Little Sister their Viet Coconut Braised Pork and Quail Eggs dish uses mini quail eggs, goes light on broth, adds fresh-sliced and dried chilies and tops the braise with a pile of fresh cilantro – it’s a slam dunk!! Also on the tasting was the Red-braised Pork Belly with crispy shiitakes and leek fondue – a nod the French and Chinese culinary influences during colonialism. Last, but not least was the double crunch Grilled Pork Spring Roll “Nem Nuong.” Made with fresh herbs red leaf lettuce, carrots, cucumbers, a crispy spring roll skin and served with a mild chili sauce, they were a perfect way to end an educational and delicious day.